CHICAGO, Illinois – Hawkeye great Kenny Arnold continues to battle health issues and is making progress, thanks in large part to donations from loyal Iowa fans. The former guard – and leading scorer on the 1980 Final Four team – suffered from a brain tumor and several strokes and was in dire condition 18 months ago when Hawkeye fans stepped up on Arnold’s behalf. Today, Arnold and his Iowa teammates – along with his “Teammates for Life” – are asking for Hawkeye fans to continue to help Arnold as he pushes himself through incredible physical challenges. Thanks to a few fundraising efforts in late 2016 and early 2017 – including sales of TFL shirts, a “White Out” at Carver-Hawkeye Arena and a golf outing in Storm Lake – Arnold was able to begin receiving physical therapy in July of 2017, according to Henry. After returning to Chicago, Arnold began getting physical therapy twice per week and the results were almost immediate. Arnold’s progress has been remarkable. 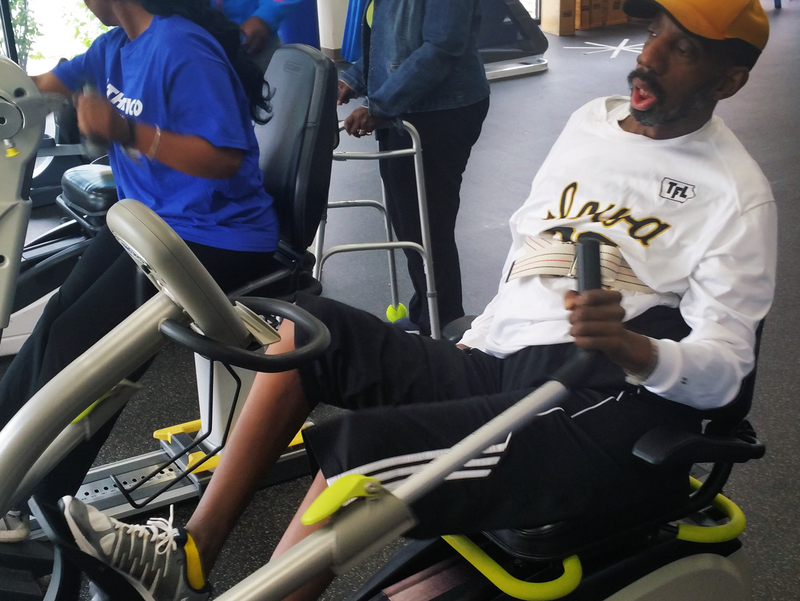 In addition to riding the exercise bike, Henry says that Arnold lifts weights and has even been able to stand up, with assistance, for more than two minutes at a time. “He stood up for 2 minutes and 20 seconds a couple of weeks ago,” said Henry. But, he cannot do it alone. Arnold has two major allies, or support systems, that so many people don’t have. One is Mike Henry, who has taken such excellent care of his best friend and become as much of an inspiration as Arnold himself. The other big support for Arnold is the Hawkeye faithful. “We were able to get Kenny started in physical therapy because of the money we raised with the shirts, the White Out and the golf outing,” said Henry. “Otherwise, I hate to think of the shape that he would still be in today. He was in such unbearable pain. The physical therapist told us that once he started gaining some strength, the pain would be reduced … and that has been true. But, according to Henry, they have to pay out-of-pocket for the twice-per-week therapy sessions. And that’s where the donations from Iowa fans come into play. “We want to do everything we can to improve Kenny’s quality of life,” said Henry. “If he can fight as hard as he’s been fighting – for more than 30 years – then he surely deserves all the support we can give him. Henry adds that Arnold is forever grateful to the Hawkeye faithful who stepped up for him a year ago to help push him to keep fighting. The results are obvious to anyone who has seen Arnold’s progress in the last two years. Henry said that he would like to find a way to get Arnold back to Iowa City and the state of Iowa again this year sometime. “Kenny wants to give a big ‘thank you’ to all the Hawkeye fans for all the love and support,” said Henry. “It’s had such a tremendous effect on him, not only physically, but also emotionally.